what a fun layout!I love how you thought to use an arrow to show your grandpa!! Wow! The historian part of me wants to look at this photo all day. What a find! You did a beautiful job scrapping it. I have sat and looked at this layout and photo for a long time and even showed my daughter! 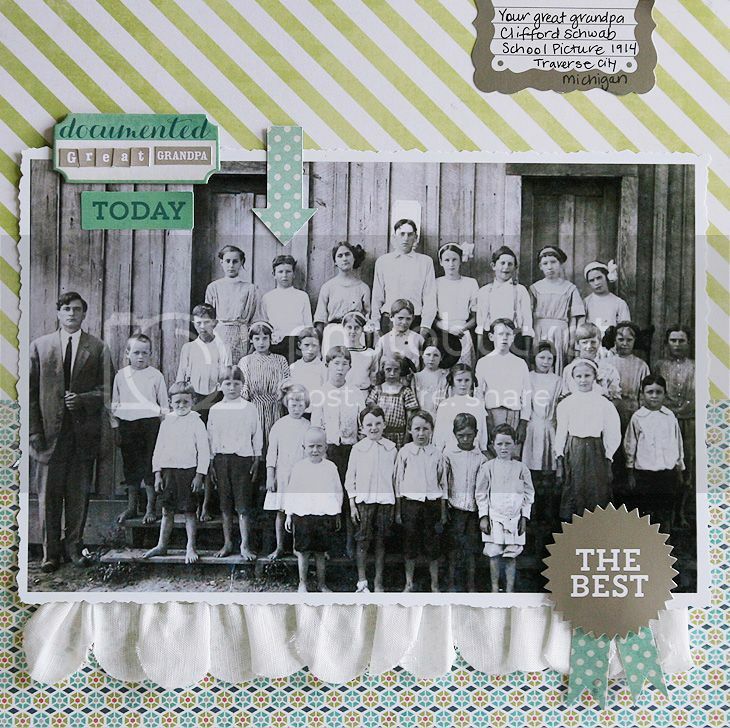 This is such an awesome example of what my idea of scrapbooking is and should be. Kudos to you for a job well done! Awesome! Great layout! Love the large photo with minimal embellishing! Amazing photo Mary Ann! Love how you used the large size and added the stitched ruffle! Lovely layout, the photo is amazing! Such a great picture to have. Thanks for sharing how you use the trim, I never thought of flowers. That photo is priceless and your layout honors it so well. I also appreciate the tutorial. It looks much easier when you break it down. If my grandmother would only give me her photos, I would be able to scrap them. She's not being cooperative! I told her I'd scan them and give them back to her. I love all the vintage pages you do. I've even shown her!